First off, all of us at The Mike Sannes Real Estate Team would like to wish you and yours a fantastic Thanksgiving holiday. Thanksgiving is an amazing and truly American holiday that brings together family and friends to give thanks and celebrate the many blessings for which we are all grateful. Family, friends, great food and football, who could not be grateful for that! We hope you all enjoy a wonderful holiday weekend!! Much has changed since our last Big Bear real estate market update: Yesterday brought our first few inches of snow and it finally feels like winter is indeed on its way and soon will be here to stay. And according to a few “market watchers,” the “Winter is Coming” mantra from the famous HBO series we all adore, may also apply to the economic outlook for 2017. Given that business cycles always run their course and then change, and based on historical data, a chilly economy may be coming next. I am not sure I agree with that completely, however. If the short-term equity markets are any indication, the new administration (love them or hate them) is being perceived as very business friendly, but time, of course, will tell the tale. Either way, it is certain to be an interesting year. The biggest news in the Big Bear real estate market from the macro perspective is the bounce in interest rates. Along with the rise in the stock market, the yield on the the 10-year treasury bond has taken off over the last few weeks as well, which has in turn raised interest rates on mortgages a solid ½ point. However, keep in mind that even with this most recent bump, interest rates are still at historically low levels. That said, this turn from the bottom could very well indicate a new trend and, as the Fed has indicated they are intending to raise rates again in December (which would seem to be already priced in now), we could very well be looking at interest rates on 30-year mortgages edging up from the ‘at or below 4%’ area, to between 5%-6% in the coming year. Interest rates of course, have a big effect on real estate values: when monthly payments go up, buyers often cannot afford to continue paying more for homes. This could put a ceiling on, or even cause a decrease in, prices in the coming years if rates were to stay above 6% for any length of time. Currently, there are 453 residential homes on the market and 175 in escrow. 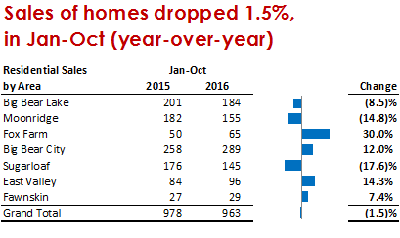 Using a typical 45-day close, these figures represent 3.8 months of inventory (equates to a slight sellers’ market). It is seasonally typical for the inventory to decrease here in Big Bear as we head into winter. Year-to-date (through October), the Big Bear real estate market has performed well as the average price of all those sold this year compared to the same period last year has increased 6.3%. This increase has been more evident in some areas and price ranges than others, as the chart to the right indicates. In addition to prices, the total number of sales is a number we track closely as it is the best indicator of which direction prices are heading going forward. When sales slow for an extended time, prices tend to eventually soften, and vice versa. 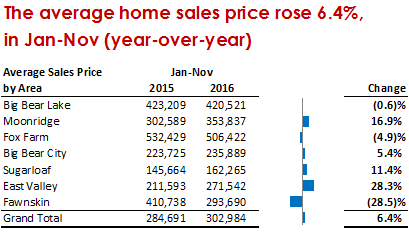 Sales in 2016 have been relatively flat compared to last year, posting a 1.5% decline year-to-date (978 in 2015 vs 963 in 2016). But the trend for September and October was momentum: those 2 months had a 3% and 2% increase compared to 2015 respectively. It will be interesting to see how December shakes out and how this year ends up. We’ll continue to keep an eye on the Big Bear real estate market and will keep you posted. Please do let us know if you have any questions on the market, any properties for sale you see up here, or if you are interested in knowing the current value of your Big Bear property, (Just fyi, Zillow is typically still way off in Big Bear regarding home values.) We always look forward to hearing from you. Until next time: All the best and happy hunting! Posted in 2016 Posts on November 23, 2016 by Mike Sannes.